Jones, Bobby (Robert Tyre Jones, Jr.). 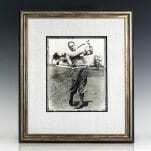 Original photograph of Bobby Jones swinging a wood on the fairway. Boldly inscribed by Bobby Jones. The photograph measures 7.5 inches by 9.25 inches. Triple matted and framed. The entire piece measures 15.5 inches by 18 inches. 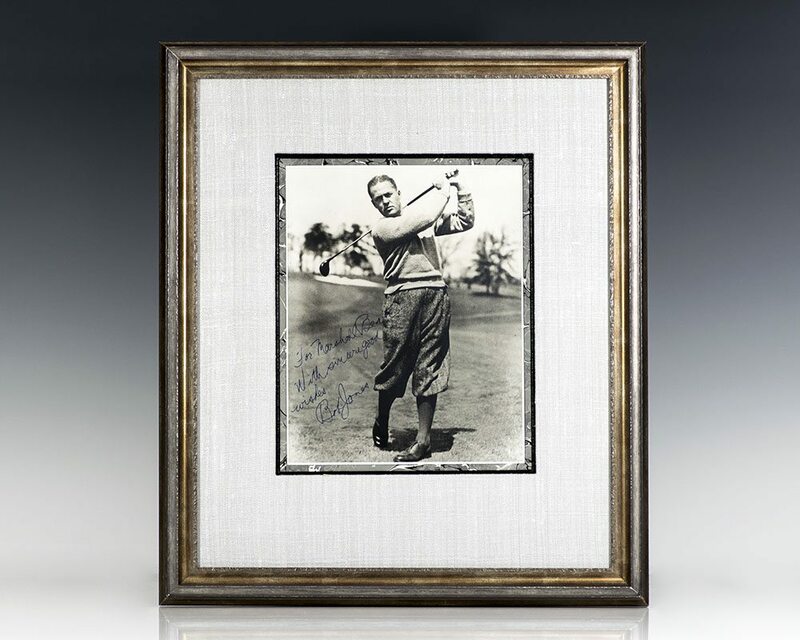 Photographs signed by Bobby Jones are uncommon. 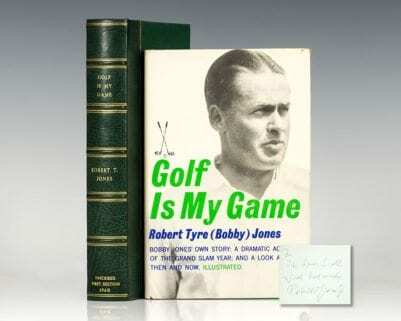 Robert T. Jones was an American golfer who was one of the most influential figures in the history of the sport. Jones founded and helped design the Augusta National Golf Club, and co-founded the Masters Tournament. The innovations that he introduced at the Masters have been copied by virtually every professional golf tournament in the world. Jones was the most successful amateur golfer ever to compete at a national and international level. 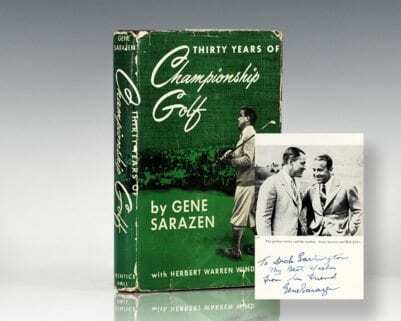 During his peak from 1923 to 1930, he dominated top-level amateur competition, and competed very successfully against the world's best professional golfers. Jones often beat stars such as Walter Hagen and Gene Sarazen, the era's top pros. Jones earned his living mainly as a lawyer, and competed in golf only as an amateur, primarily on a part-time basis, and chose to retire from competition at age 28, though he earned significant money from golf after that, as an instructor and equipment designer. Explaining his decision to retire, Jones said, "It [championship golf] is something like a cage. First you are expected to get into it and then you are expected to stay there. But of course, nobody can stay there." Jones is most famous for his unique "Grand Slam," consisting of his victory in all four major golf tournaments of his era (the open and amateur championships in both the U.S. & the U.K.) in a single calendar year (1930). 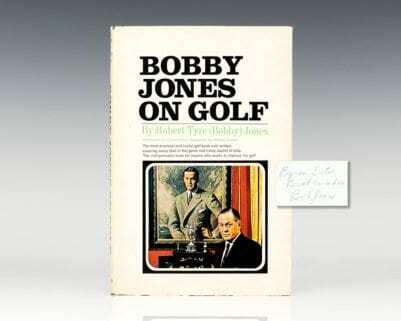 In all Jones played in 31 majors, winning 13 and placing among the top ten finishers 27 times. After retiring from competitive golf in 1930, Jones founded and helped design the Augusta National Golf Club soon afterwards in 1933. He also co-founded the Masters Tournament, which has been annually staged by the club since 1934 (except for 1943–45, when it was canceled due to World War II). The Masters evolved into one of golf's four major championships. Jones came out of retirement in 1934 to play in the Masters on an exhibition basis through 1948. Jones played his last round of golf at East Lake Golf Club, his home course in Atlanta, on August 18, 1948. A picture commemorating the event now sits in the clubhouse at East Lake. Citing health reasons, he quit golf permanently thereafter. Photograph of Bobby Jones swinging a wood on the fairway. Boldly inscribed by Bobby Jones, “For Dave, my best, as ever, Bob.” The photograph measures 7 inches by 9 inches. Bouble matted and framed. The entire piece measures 16.25 inches by 18.25 inches. 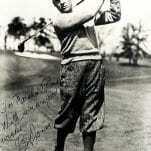 Photographs signed by Bobby Jones are uncommon. Rare signed portrait of Bobby Jones seated with his golf clubs after a painting by Margaret Fitzhugh Browne. 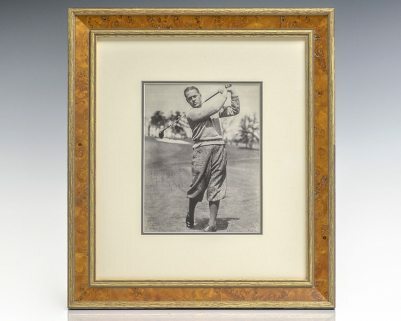 Signed and dated by Bobby Jones beneath the portrait in the year the portrait was published in Golf Illustrated Magazine, “Robert T. Jones Jr. Dec 29, 1930.” In fine condition. Double matted and framed. The entire piece measures 17 inches by 14 inches. Unique and desirable. 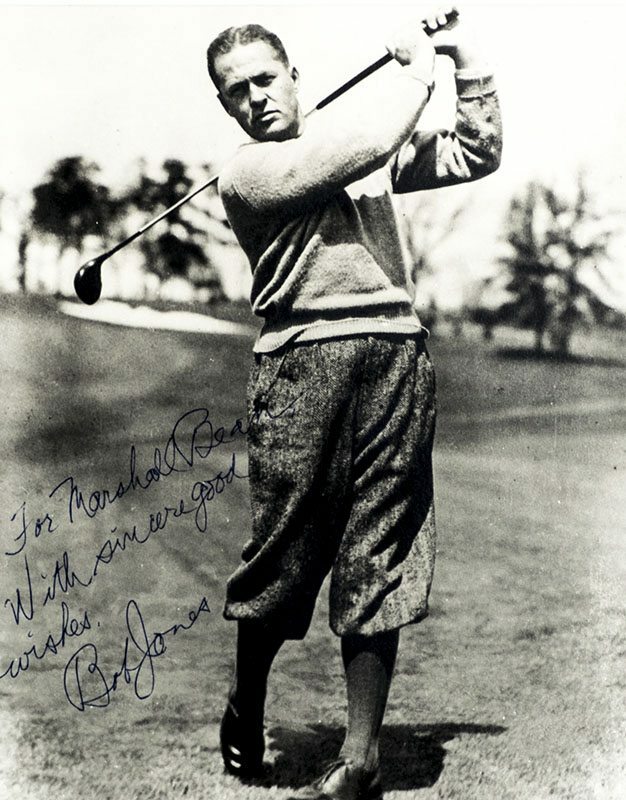 Photograph of Bobby Jones, boldly inscribed by him, “For Dave Christensen with warmest regards Bob Jones.” The photograph measures 7 inches by 9 inches. Double matted and framed. The entire piece measures 15.5 inches by 18 inches.